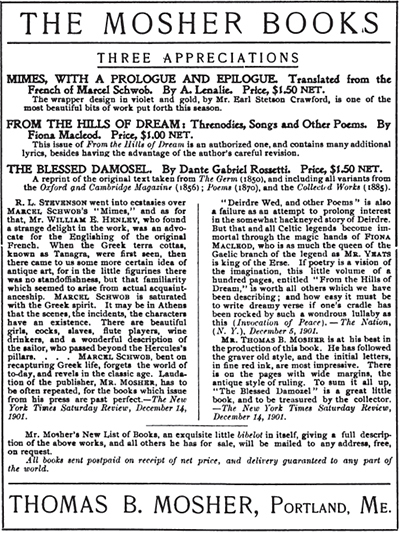 We continue with our three-part series on vintage rare book trade ads from The Literary Collector, 1902. 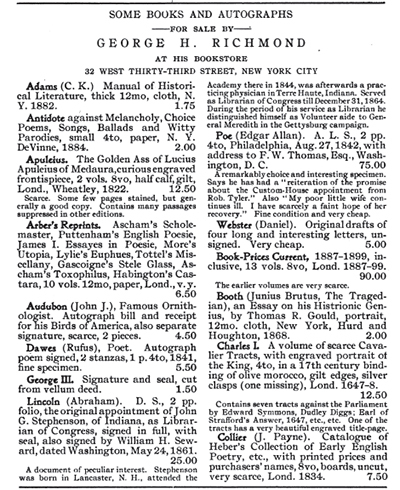 You can catch-up with American Rare Book Trade Ads From 1902, Part I here. There is no mention of our hapless bookseller S.F. 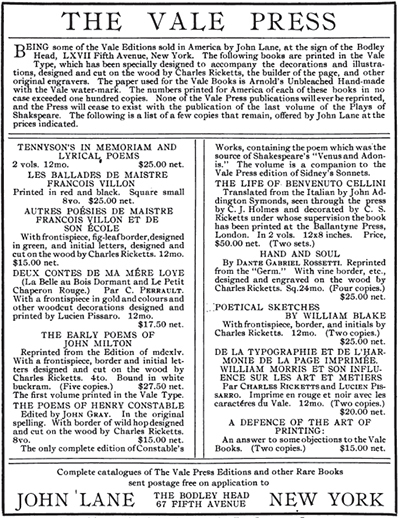 McLean & Co. in Madeleine B. Stern's invaluable Antiquarian Bookselling in the United States: A History from the Origins to the 1940s (1985) or in Dickinson's Dictionary of American Antiquarian Booksellers (1998). We know from the firm's advertisement found in Part I of this series that McLean was enduring lean times. "Something wrong. Perhaps our books are N.G. Don't think they were priced too high." Above, however, McLean faces down the demon. Macmillan's beautiful 1898 edition of the Rubaiyat of Omar Khayyam originally sold for $3.50. McLean offered an as new copy (perhaps a remainder) for 65¢. Find a copy now and it'll set you back $300-$400. Stayed tuned for Part III of this series, in which S.F. McLean & Co. gets down to the real nitty-gritty in 36-point pica. 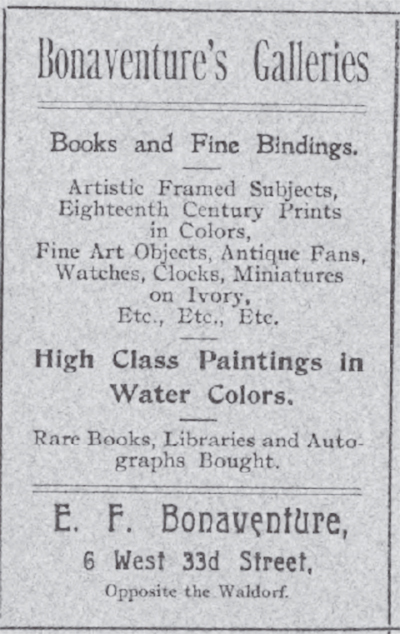 Advertisements for E.F. Bonaventure can be found as early as 1885. "Additions to my stock are being made constantly, both by direct consignments from abroad and by the purchase of libraries amd private collections. As I visit the European Bookmarts annually, and have made arrangements with the principal publishers there, I receive all the finest publications, (especially Parisian), as soon as issued. "I have on hand a large assortment of etchings and engravings — both Ancient and Modem — many in fine proof state," he declares in an 1885 catalog. The press of Thomas B. Mosher fulfilled the same mission in the United States. Booksellers Daniel O'Shea, E.W. Johnson, Davis' Bookstore, and Shepard Book Company escaped the notice of Stern and Dickinson. Of Shepard Book Company of Salt Lake City, Utah - "We carry the largest stock in the world of books on Mormonism, Anti-Mormonism and the West. Also curious, rare and old books on every subject" - all I can say is, Hello Ken Sanders Rare Books of SLC, "Creating Chaos Out Of Anarchy for a Better Tomorrow." Ken, known to the general public as the rare book appraiser on Antiques Roadshow with gray ponytail, long gray beard, and merry eyes that can melt your brain with their gaze and a heart that can melt yours, has successfully assumed Shepard Book Company's mission. Mrs. Helen Schlie is definitely not in the same league - nor on the same planet - with Ken. George H. Richmond (1849-1904) began his career in the trade in 1877 as assistant to Robert H. Dodd, who managed the rare book department of Dodd, Mead, the bookshop that became a publisher. Leaving Dodd in 1892, he tried his hand at subscription publishing but, three years later, in 1895, bought the stock of a bookdealer and established his own shop. He was "one of the most able and daring of the New York booksellers." 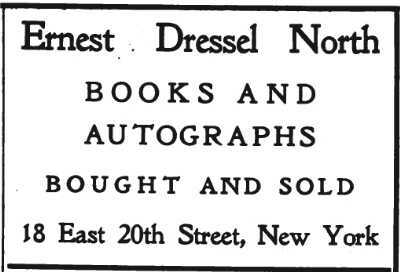 The above 1902 advertisement for rare book dealer Edward Dressel North (1858-1945) is significant. That was the year he opened his own shop after an apprenticeship that began in the early 1880s as a cataloger for Scribner & Welford, a position he held until he opened his store. His was a diverse stock - American and English literature, European history, fine press books, art, architecture, travel and biography. His cataloging experience served him well. 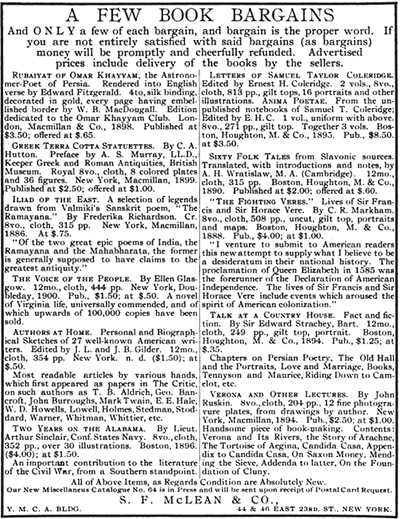 Through carefully written and edited sales catalogs he attracted the attention of the great tycoon book collectors. Henry C. Folger, Frank J. Hogan, and Henry E. Huntington became regular clients. His immortality, in my view, rests with his telling Huntington to take a hike. "North never compromised his own professional independence. 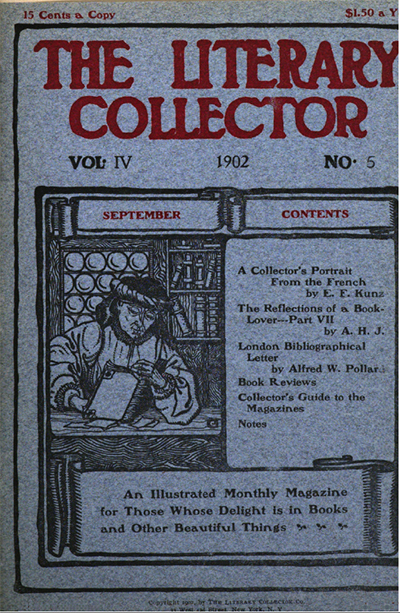 In March, 1919, when Huntington asked for a discount on a particular item, North told the California collector that he 'ran a one price shop and made it an unvarying rule not to allow a discount to anyone'" (Dickinson). Thereafter, Huntington, of course, bought from other dealers. North survived and thrived,. He, at times, rivaled Rosenbach in the auction rooms, much to Rosenbach's chagrin as he was often bidding on Huntington's behalf, who must surely have cursed North, who must surely have laughed. More vintage trade ads in Part III. STERN, Madeleine B. Antiquarian Bookselling in the United States (1985). DICKINSON, Donald C. Dictinary of American Antiquarian Bookdealers (1998).